The spatial sense is something very important and, above all, the origin of coordinates. The universe of strings that our senses capture is a three-dimensional Euclidean universe with an extra dimension that is time (which as I tell you the other day) are related. 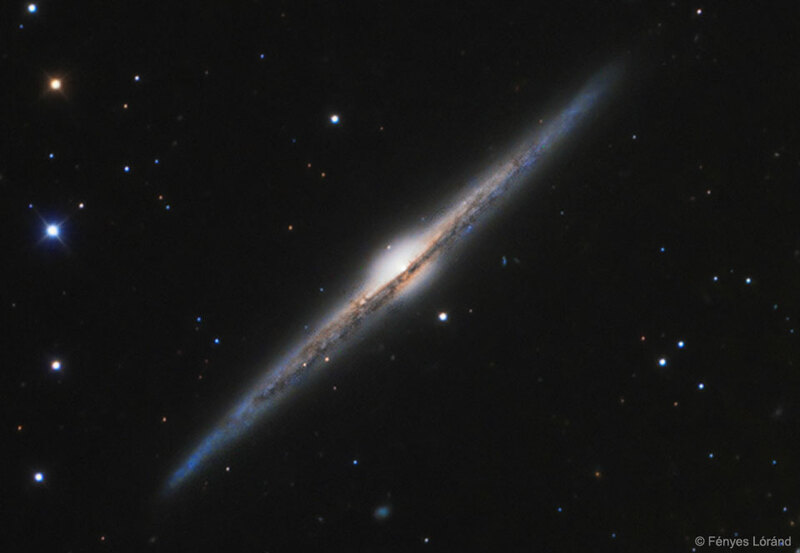 To understand the image that accompanies to this post the galaxy NGC 4565 that in itself has nothing of particular except its orientation with respect to the Earth. And it is that, as we see, although many think that a “small” galaxy is its orientation that makes us appear this way since it is more than 100 thousand light-years wide. Located about 45 million light years from here and only visible in the northern hemisphere in the Virgo cluster on Coma Berenices constellation, it is a very bright standard spiral galaxy because the quasar in its center, precisely its position with respect to We have less dust that covers the hot gases that surround it. It is interesting to know that the NGC 4565, being a spiral galaxy, is the example of what is called galactic bulb, which is what comes to this post apart from indicating that the point of view is Something very important. It is called a galactic bulb to stars that form a spiral galaxy and have an ellipsoidal arrangement. That is, the distribution of all the stars that make up the galaxy are contained in an ellipse. It is simple. The position of the stars follows that pattern because in the center of the galaxy containing the bulb there is always a quasar (not a black hole, or if) and are the first to be observed and calculated precisely that the Mass contained in the bulb did not match the mass of the stars (thanks to the measurement of the rotation around the quasar since the inner stars rotate at the same speed as the outer stars something that by the angular moment can not be like this ) And therefore had to exist “something” (dark mass) that increases the mass of the inner stars and, therefore, maintains its angular momentum constant in front of the distance to the quasar. Hence the importance of the galactic bulb.